The suit seeks to recover the cost of cleaning up chemical contamination in wells throughout Suffolk County. The Suffolk County Water Authority on Thursday sued the Dow Chemical Co., the 3M Co. and nine other manufacturers and distributors of firefighting foams, industrial degreasers, laundry detergents and other household products, claiming they contained harmful chemicals that polluted the county’s public water wells. In two separate product liability lawsuits filed in U.S. Eastern District Court in Central Islip, the water authority said it found in its water supply 1,4-dioxane, a man-made chemical widely found as a byproduct in cleaning and personal care products, as well as perfluorooctanoic acid, or PFOA, and perfluorooctane sulfonate, or PFOS, ingredients found in foams once commonly used in fire suppression. All three chemicals have the potential to cause cancer, according to the he U.S. Environmental Protection Agency. The water authority, which serves 1.2 million residents in Suffolk County and maintains about 600 wells, is suing the companies to recover “substantial” costs to treat and clean up the contaminants now and in the future, arguing that the companies knew or should have known that these chemicals would end up in the county’s groundwater and threaten public health. The lawsuits did not specify the damages the water authority is seeking, but its chairman, James Gaughran, estimated that cleanup costs will be in the “millions”. “The thrust of these lawsuits is to try to reclaim money for the current and future costs that we are going to have in terms of treating the water as well as, in some cases, having to shut down wells and buy property to build new wells,” he said. Spokespeople for seven companies declined to comment or did not return calls seeking comments. Attempts to reach representatives of the other four companies were unsuccessful. Currently, the water authority is using a granular-activated carbon treatment system to remove PFOA and/or PFOS from drinking water at about 15 wells throughout the county, according to its spokesman. It cost about $1 million to install one granular-activated carbon treatment system, Timothy Hopkins, attorney for the authority, said in an interview. He said there are additional costs to maintain it. In one lawsuit — filed against 3M Co. and others that manufactured, distributed and sold aqueous film-forming foam, which contained PFOA and/or PFOS — the authority contended the chemicals had been used for half a century at the Francis S. Gabreski Airport and the Gabreski Air National Guard Base, both in Westhampton Beach. “During routine training exercises, . . . [foam] has been sprayed directly on the ground, allowing PFOS/PFOA to travel to the surrounding groundwater, causing contamination of various of SCWA’s water supply wells, in various locations, in varying amounts, at various times,” according to the lawsuit. In the second lawsuit, the authority said 1,4-dioxane, most widely used in industrial settings as a stabilizer for chlorinated solvent, is also a byproduct of detergents, soaps, shampoos, cosmetics and other household products. 1,4-dioxane, the lawsuit said, does not stick to soil and does not break down easily. There is no drinking water standard for the chemical, which has been found in trace amounts in more than half of the authority’s wells. 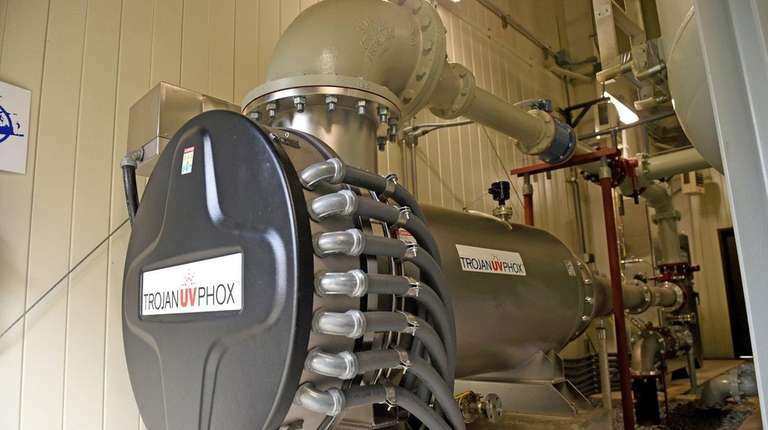 “In sum, once it is applied, discharged, disposed of, or otherwise released onto land, 1,4-dioxane migrates through the subsurface and into groundwater, resists natural degradation, and is difficult and costly to remove from water,” according to the lawsuit. The Suffolk County Water Authority has reached settlements in the past with makers and sellers of dry cleaning compounds and equipment for contaminating the county’s drinking water, authority officials said. Chemical found in LI water spurs push for stronger standardsAs a Newsday investigation found, drinking water samples have shown abnormally high levels of 1,4-dioxane, a chemical found in products including detergents and baby wipes.